Comedogenic oils and pore clogging ingredients commonly found in skin care and cosmetics are a major cause of blackheads, whiteheads, and break outs. If you have acne prone skin, it's important to make sure your skin care products don't contain comedogenic ingredients. Before you put anything on your skin, including acne treatment products, make sure they don't contain the acne causing ingredients and comedogenic oils on this list. What Are Non Comedogenic Ingredients? Comedo is the technical term for an acne impaction made up of dead skin cells and sebum (oil). If you have several of these lesions, they're called comedones. non comedogenic means: not tending to clog pores.You may also see the term non-acnegenic. Most people with acne prone skin have been told to look for non-comedogenic skin care products. Unfortunately, you can't always rely on that advice. Did you know? Skin care manufacturers are NOT required to "pass a test" in order to claim their products are non-comedogenic. It's true. They can use the term "non-comedogenic" on skin care labels without actually having tested the final formula for it's pore clogging potential. That means, essentially, these claims mean NOTHING to you in your search for clear skin. Lots of hair care, make up, and skin care products contain acne causing ingredients even though they're labeled "non comedogenic". For example, Retin-A cream contains a highly comedogenic ingredient called Isopropyl Myristate. Yet, dermatologists routinely prescribe it for people with acne prone skin. It's no wonder millions of people struggle with acne! Can I Trust Oil Free Skin Care Products? The term "oil free" simply means that the product contains no natural oils. But, not all oils are pore clogging. In an effort to make lightweight products that feel good to people with oily skin, skin care companies use silicones and other synthetic emulsifiers to replace natural oils in their products. Unfortunately, these "oil free" agents often cause blackheads, whiteheads, and acne break outs. Compare your current skin care and make up products against our list of pore clogging ingredients, and take it with you when you shop. It's a pretty long list, and some of the ingredients look or sound similar. Don't try to memorize everything on it . . . . Just refer to it before you try anything new. 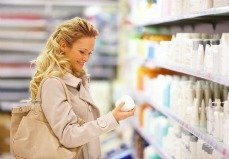 Knowing what ingredients to avoid will save you a lot of money and frustration because you won't have to rely on trial and error when buying skin care and acne treatment products. Remember, reading ingredient labels yourself or getting recommendations from an acne expert are the best ways to avoid comedogenic oils and other ingredients that clog your pores. You can learn other ways to avoid acne here. COMING SOON! Reviews of top acne skin care products & recommendations for acne treatments that work -- stay tuned!